200-gram super silent pressing from Quality Record Pressings! 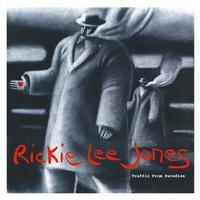 Never before released as a vinyl LP in the U.S.
From the moment she first appeared in front of us on "Saturday Night Live" in 1979, Rickie Lee Jones has challenged her listeners and the establishment with an absorbing musical vision that defies border and classification. She rocked the culture of singer-song writerdom with her refusal to conform to the stayed and careful eloquence of the folk rock generation that came before her. Neither punk nor pop, she tottered on a thread of her own device, jazz — the old musical kind, and R&B — the Motown thread that permeates her work. Her self-titled debut album, released by Warner Bros. in March 1979, had an immediate and profound impact in the music world and the culture at large, ultimately becoming a multi-million selling hit. Jones secured five Grammy Award nominations, including Best New Artist, which she won at the January 1980 ceremony. She won a second Grammy in 1989 for Best Jazz Performance for her duet with long time pal Dr. John on "Making Whoopee." Traffic from Paradise, released in 1993, features contributions from Leo Kottke, David Hildago and Jim Keltner among others. Now it's being reissued by Analogue Productions as an LP in the U.S. for the first time in its history. Traffic from Paradise, her sixth full-length studio effort overall, was produced, mixed and recorded by an all-female crew and has the energy less of a committed feminist than a woman who has grown comfortable in her skin, and who once said that her vulnerability as an artist, and as a woman, made convention seem like the least of her problems. The meditative and highly spiritual 10-song set consists of all Jones originals with a lone cover of David Bowie's "Rebel Rebel" being the only exception. Rickie sounds fantastic! Wow just a great sounding album and fantastic pressing. This is the record that I dig out on Friday nights to end the work week. Production quality is superb- so much so that I use this record to test my speaker placement. Audiophile quality! One of my favorite lps both sonically and musical content.